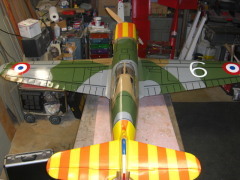 This is the Pilot Yak 54, 87 inch 50cc airplane I had bought from Donny Krenz. 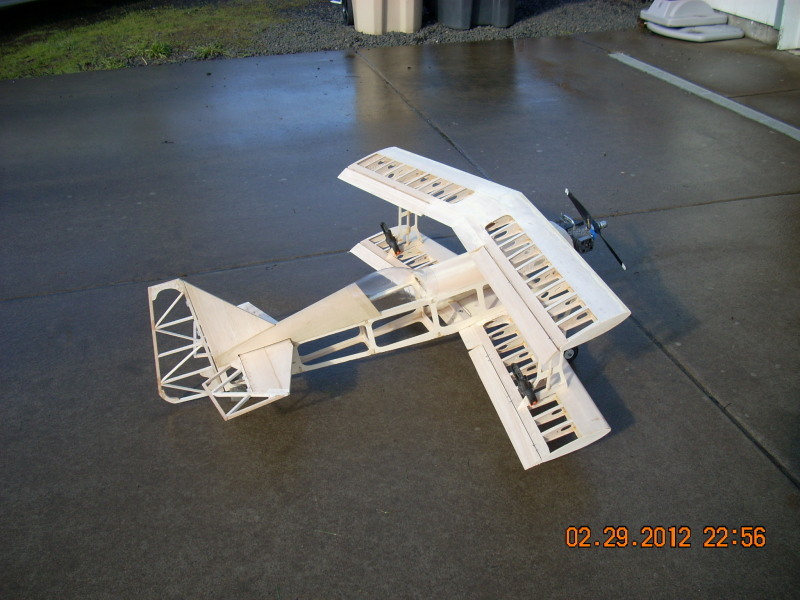 After about a dozen moderate flights, the wing cradle broke free in air, allowing the wings to flutter. The plane hit hard nearly nose first. 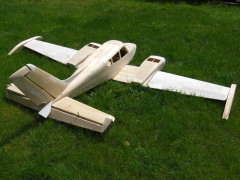 http://www.flyinggiants.com/forums/showthread.php?t=76617 I thought some of you may be interested in following the progress as well. Here is a couple before images, and after. 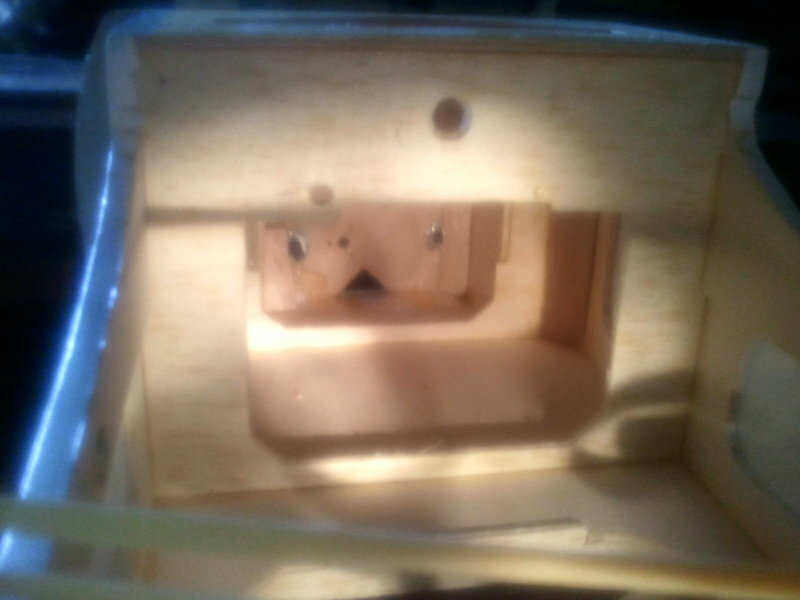 Also an image of the replacement wood Pilot sent me and some of the trim. 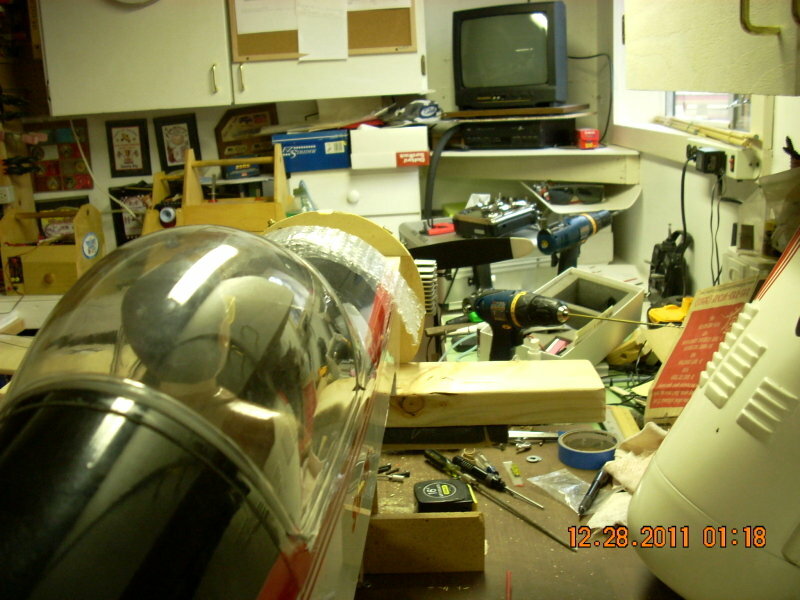 And finally a shot of the fuse as of 10-02-12 after cleaning up the damaged wood. I will purchase a new cowl and canopy from Chief. Landing gear and pants actually survived! She will be better than new again soon! 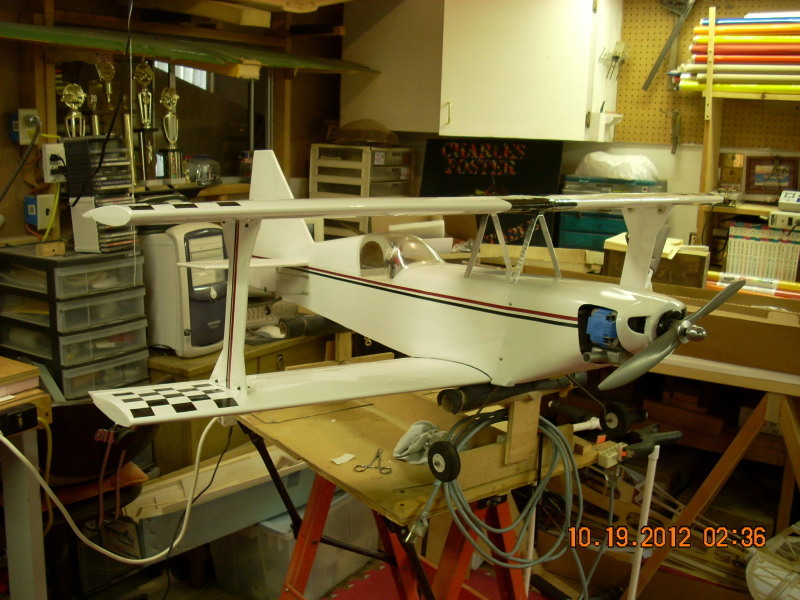 Well it's Cessna 310 time and yes I have been doing a lot of engine research. 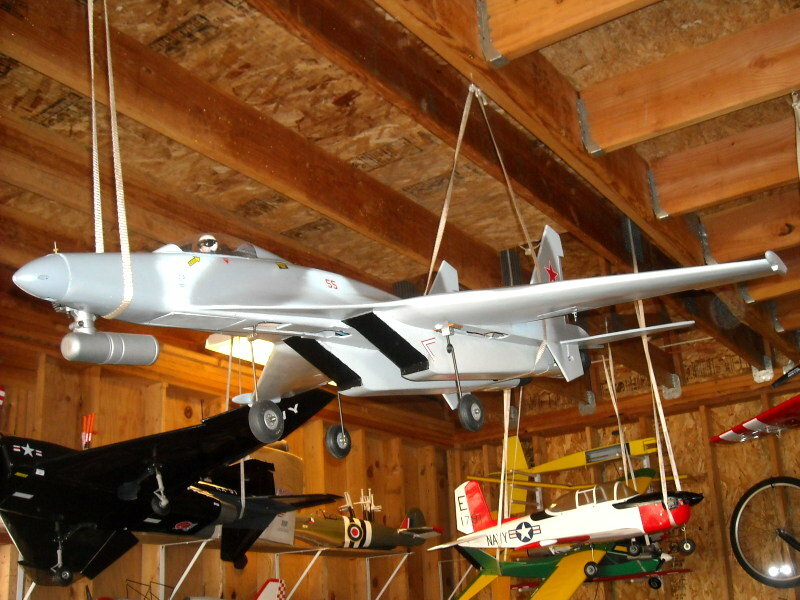 The 310 was designed around 60 size engines that were geared, so they had a bigger prop. 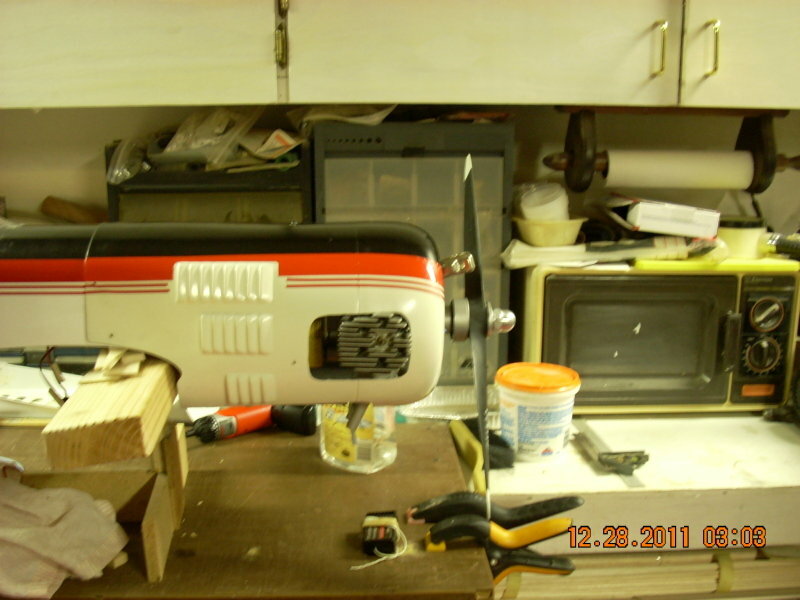 Well that is very old technology so I am putting a gassers in it. 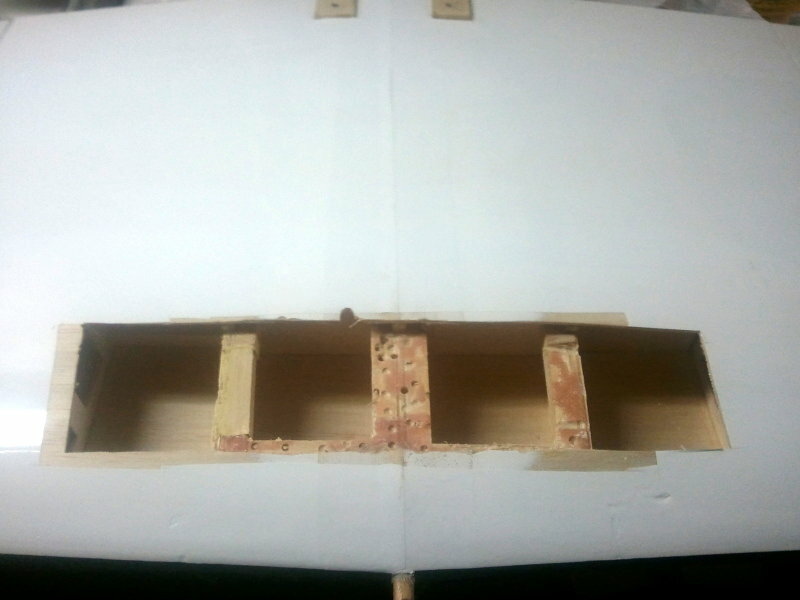 The firewall is in for the OLD engines so I will have to move it back to accommodate the new engine. I thought about the DLE 30 which is a very good engine , but my research came up with Mentor 33cc gas made in Italy and comes with a three year warranty. Now I know that with a three year warranty that they have to be proud of there engines. So I ordered one (for now) and installed it in my Energizer to break it in and put a lot of flights on it before I install it in the 310. Well , let me tell you that it is a great engine and what a power house. 4.7 HP. Starts easy and runs great. I got 7 flights on it and will be putting on more. 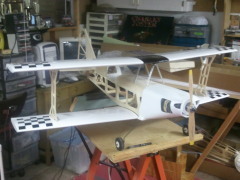 I hope to put 20 or 25 flights on it and then take if off and install the other one. 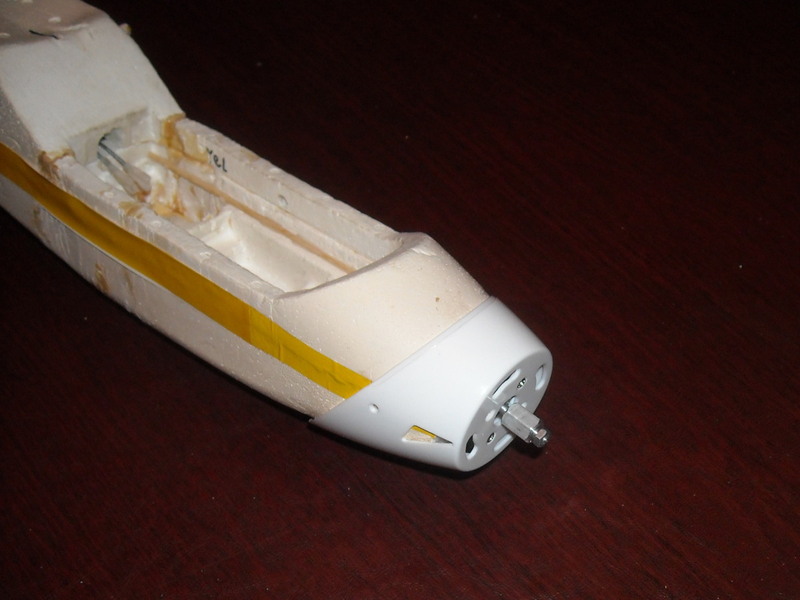 Then I can use the first on to set the firewall on both nacelles . 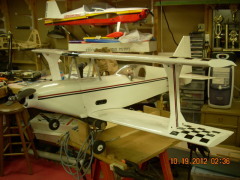 The Bud Nosen Cessna 310 will be in the 30 to 35 lbs range and the two Mintor engines with a 20 x 8 prop should fly it quite nicely. Looking forward to that. So here are some pictures of the Mintor engine. 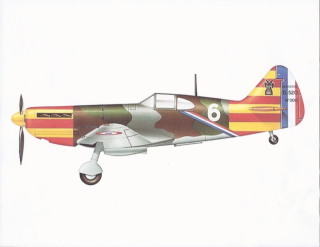 Flown until retired in 1985 - 142 flights during that time. 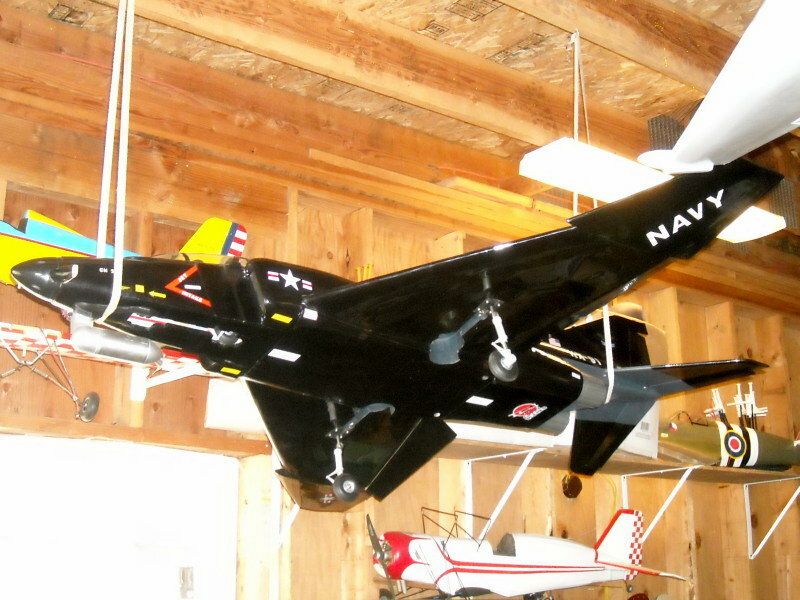 It hung in my garage for 28 years before I was inspired to add an electric motor and folding prop. mount from a ParkZone Radian. 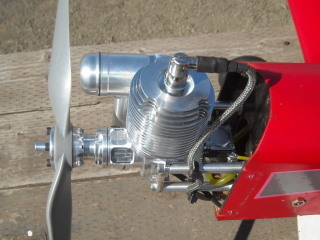 and a "RC Model 1200" Brushless motor. 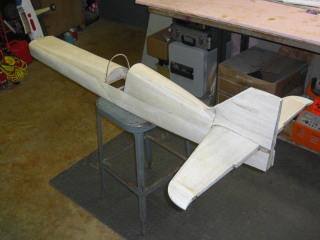 Mounted and ready for folding prop assembly. 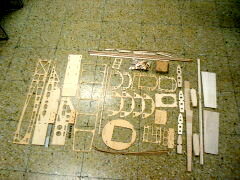 I can't remember where I put some of the parts for this airplane, fuse and wings were too big to misplace. Made a new canopy also. 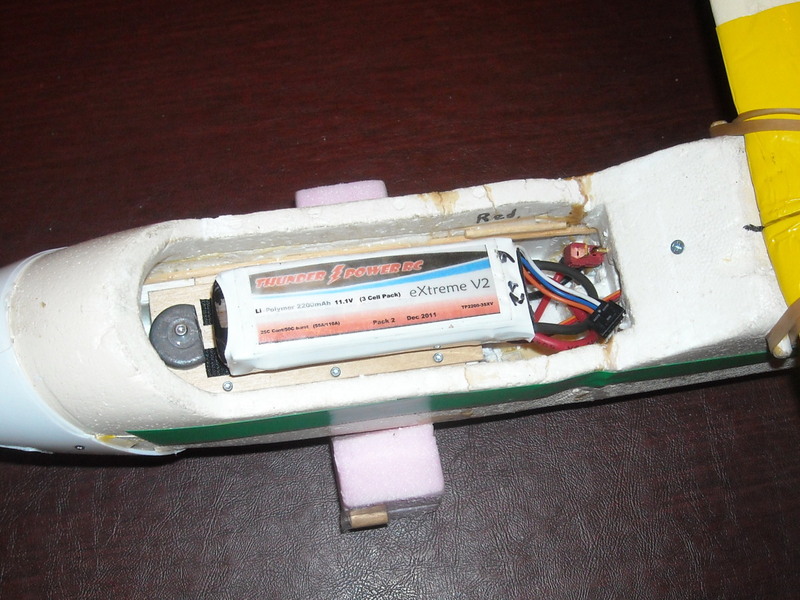 Mounted ESC in bottom of fuse, installed a plywood deck with velcro to mount LiPo battery. 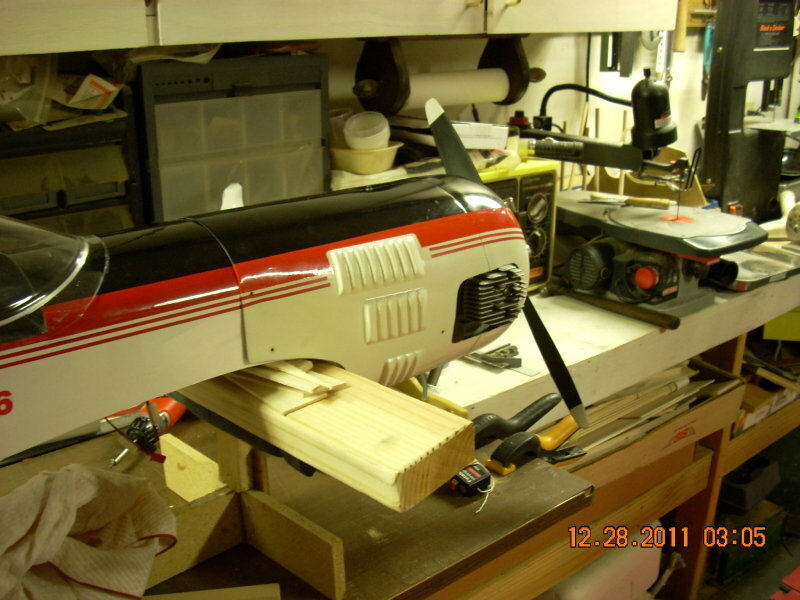 Servos mounted on outside of fuse behind CG to assist with balance. 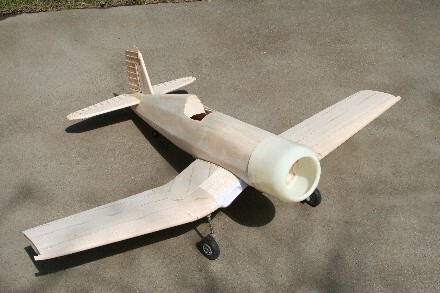 Hand launched at half power into 8 mph wind, flew well, climbs slowly at half throttle, quite well at full throttle. Got a couple thermal rides. Found it hard to land, it just wants to float. 16 minutes of air time used 503 mah from 2200 mah bat pack. 28 year rest - Maybe I should change its name to RipVan 76! Crestwell had a swapmeet a few weeks back and I attended just to see what was there. ( Boy that was a mistake). 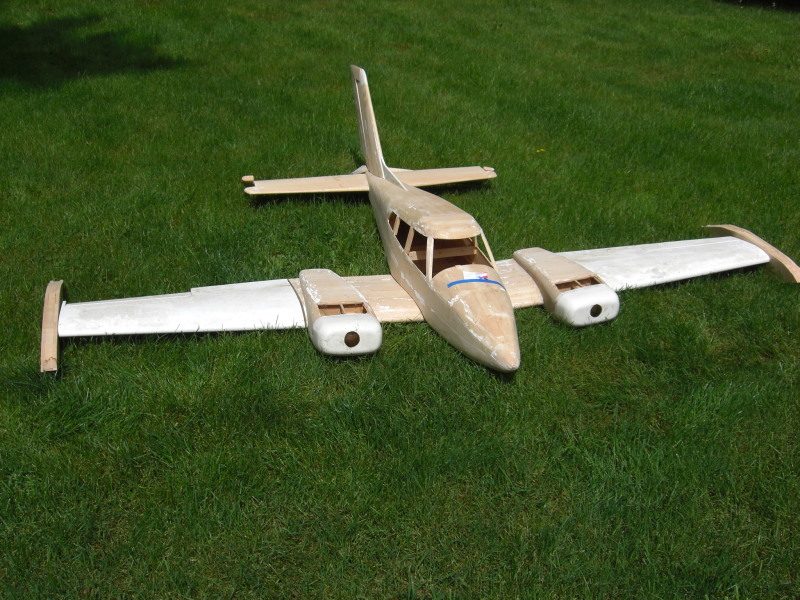 I have always loved the Cessna 310. 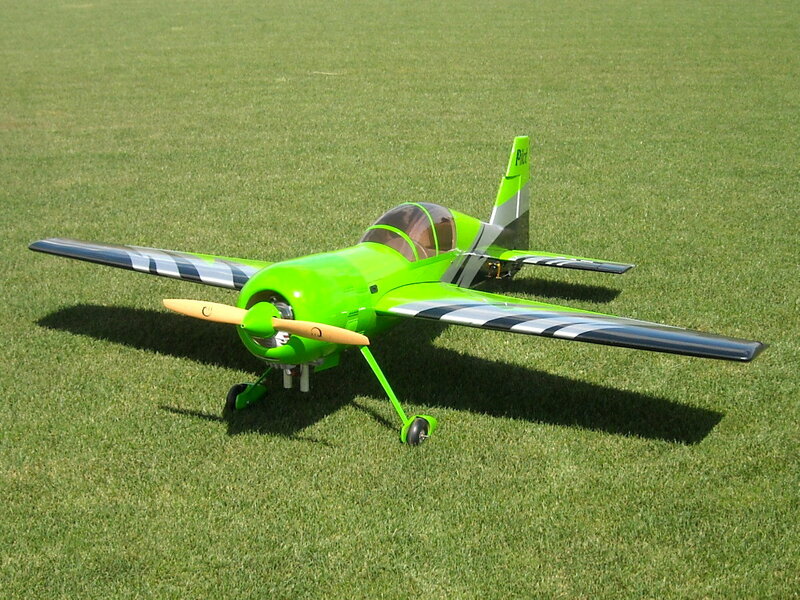 The way it looks on the ground and in the air. Besides I was a fan of Sky King on Tv, many years ago. Well there it was. 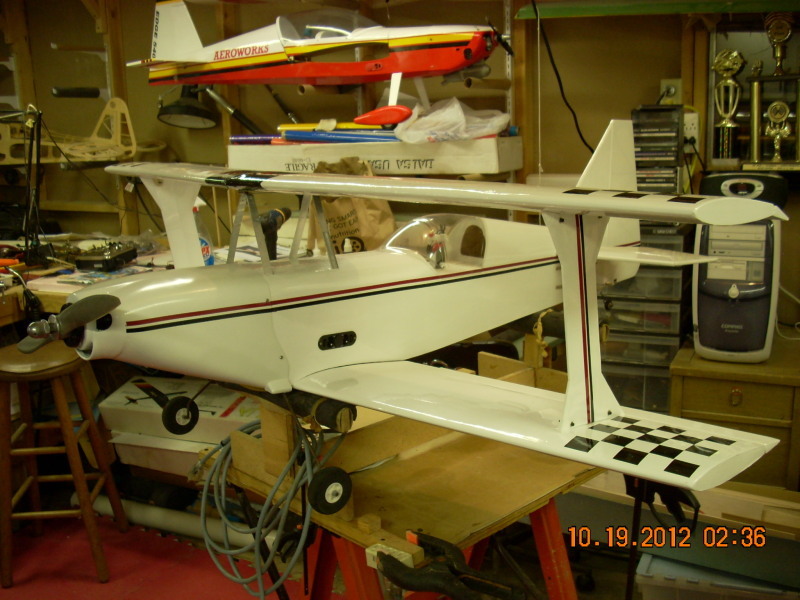 A 1201/2 inch Bud Nosen Cessna 310 already built , but needs to be completed. I looked at it all day in hopes someone else would buy it, but noooooooo.. So, I made the gent an offer and we came to terms. 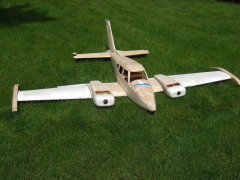 So I have been doing a lot of internet searching and found a group of Bud Nosen Cessna 310 fans on RCUniverse and joined them.. It's been fun. No I haven't started it yet. (It's not raining). So I have my next project. They keep finding me even when I'm not looking!!! All done and ready to fly!!! It weighs in at 23 1/4 lbs . 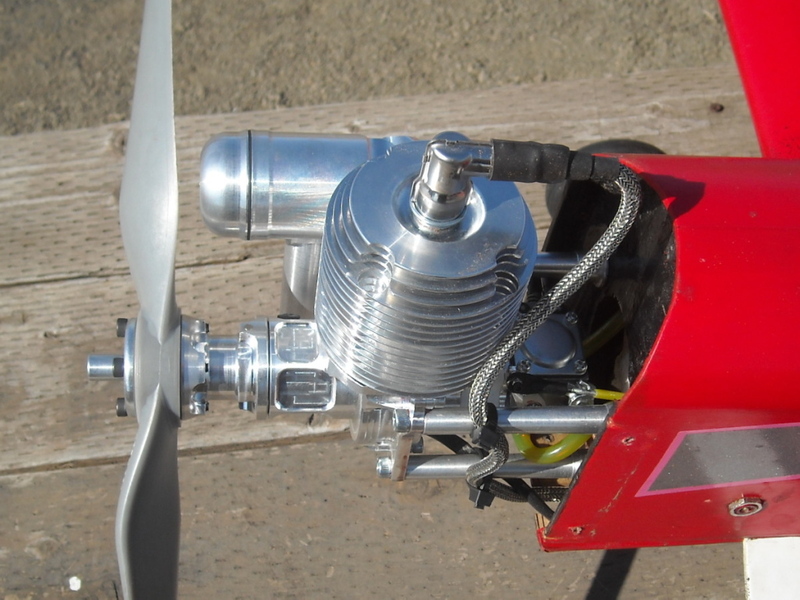 Engine has been run and working great. . 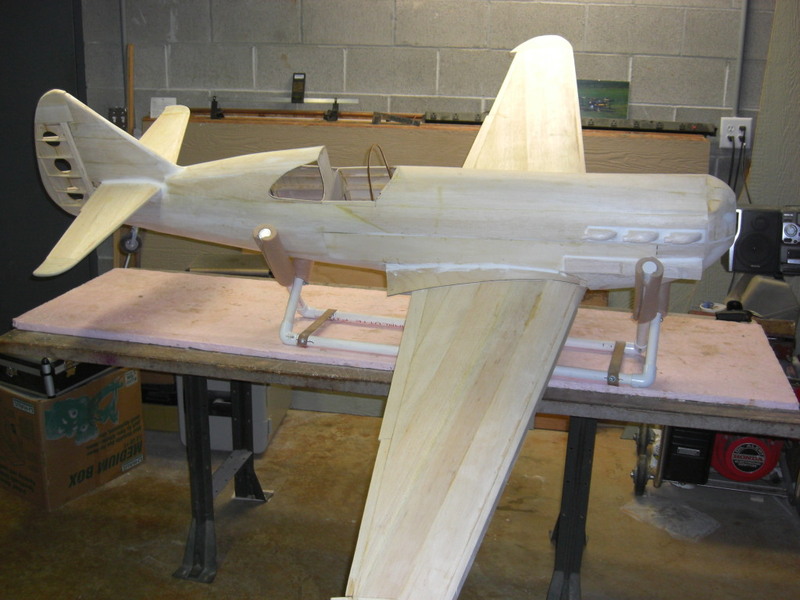 I plan on the first flight at the May fun fly.. See you there..
Picture of what it will look like when painted. Painting starts this week !! I'm so glad the sanding is ALMOST done. ! 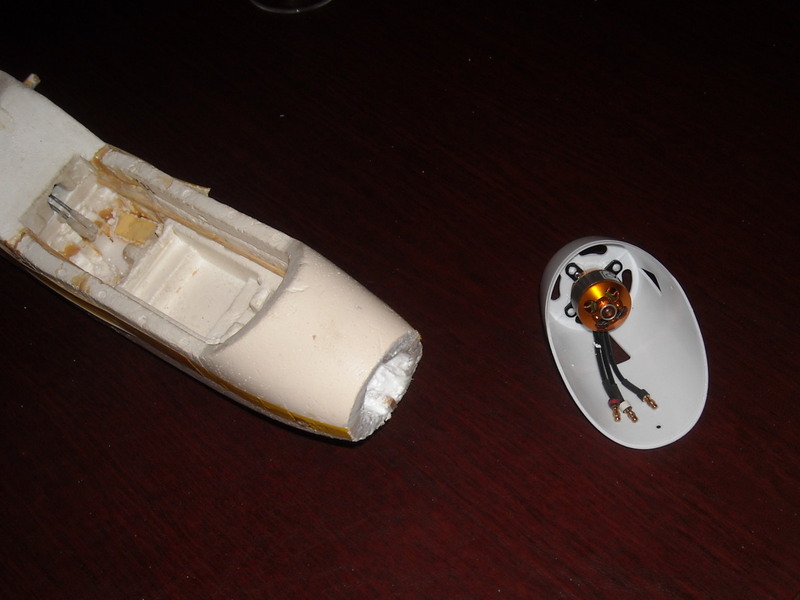 ( I don't know if you ever get finished sanding.) You just quit!!! .. It has been a while since the last update, and as you can see things are progressing. I still need to build the flaps and ailerons, complete the cowl and firewall, and spend a long time at the place called Sandamore. 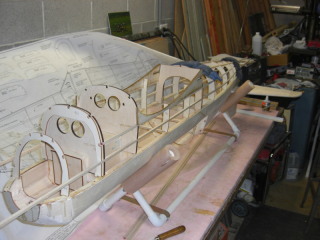 The construction will be complete, then covering and connecting everything. Should be flying by summer, I hope. Yes I'm still at it. The D520 is coming along real good. The fus is built. The tail feathers are on. 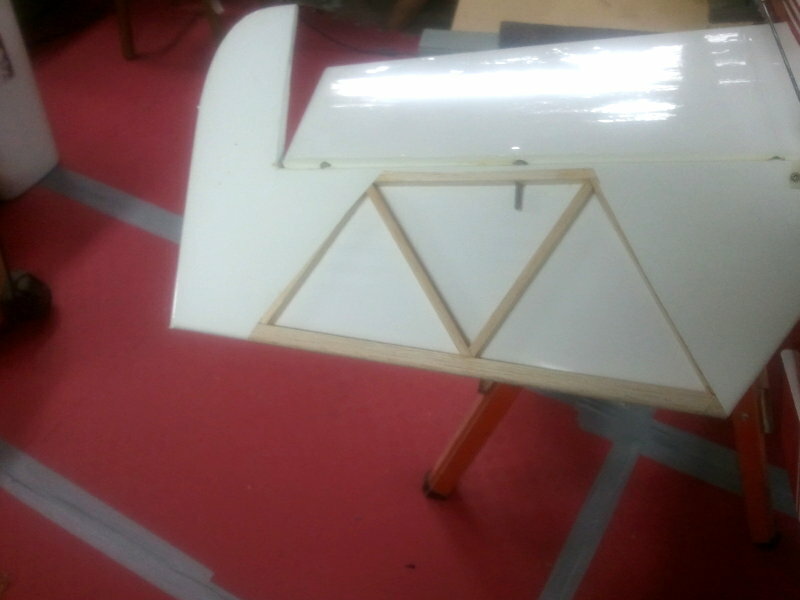 The wing is done and I'm in the process of installing all the fine stuff. 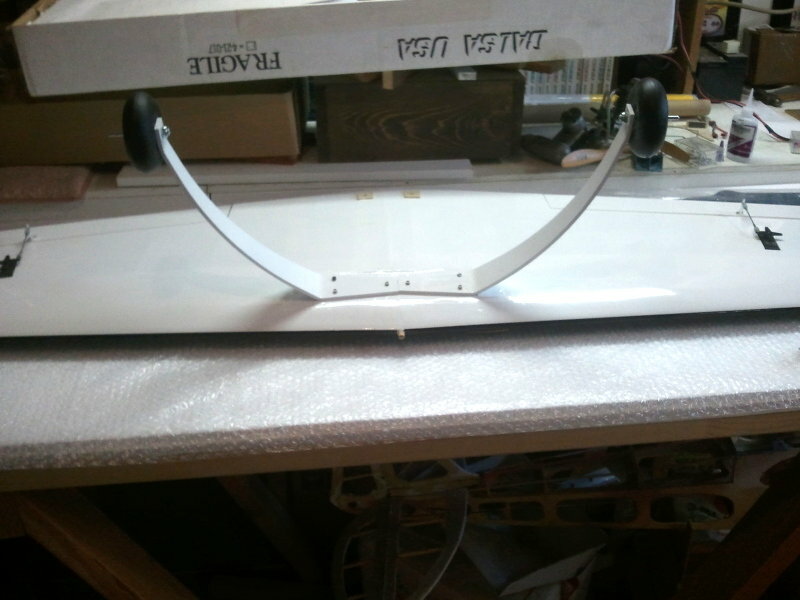 The cowling is also done and mounted. The wing has been fitted to the fus and installed. 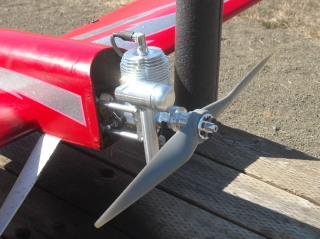 Retracts fitted and installed. 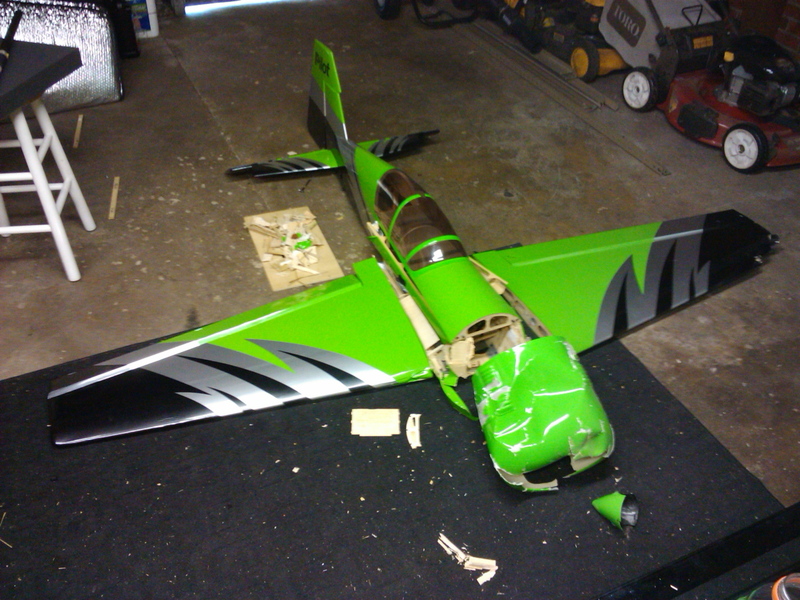 Then removed to help finish the build. 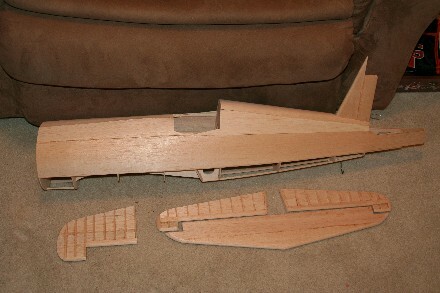 The ailrons, flaps, rudder, and elevators are done. But this plane calls for strip hinges. I have never used or installed strip hinges before and I hope I never do again. 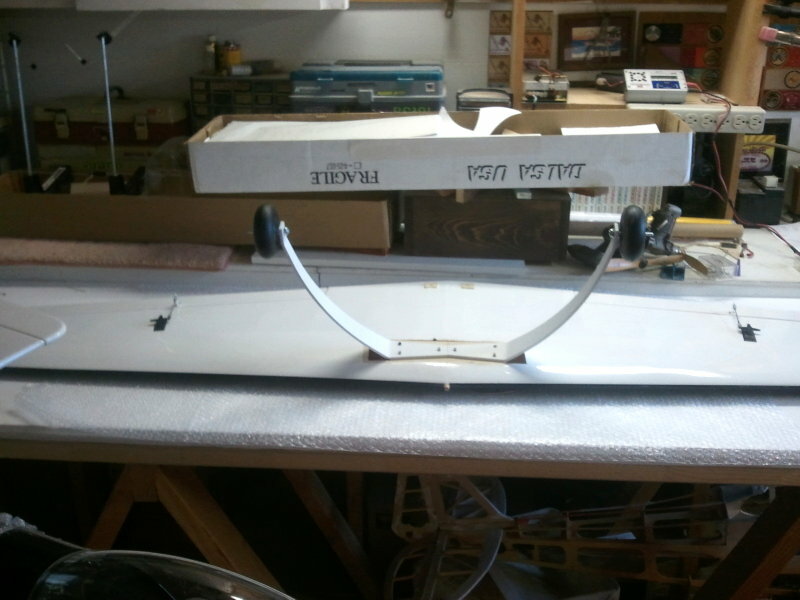 The thing that makes them hard is the aileron and flaps hing from the bottom. 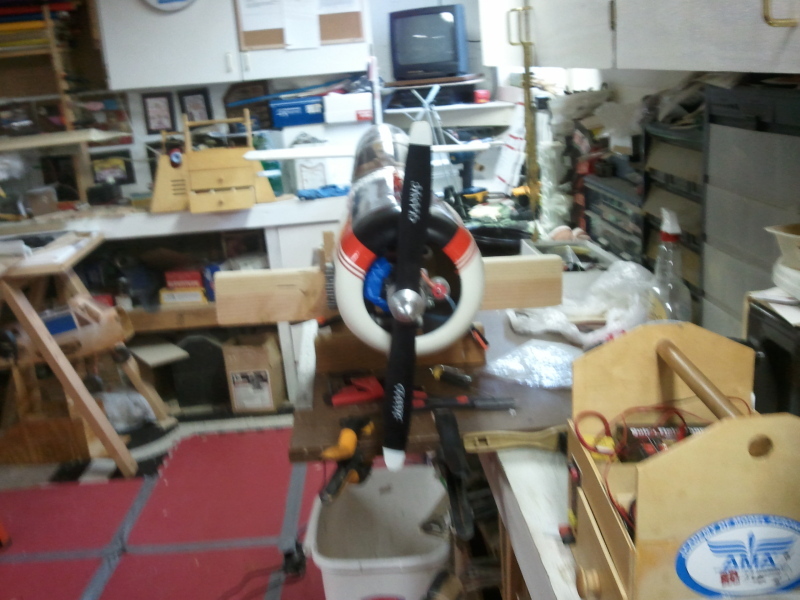 Well they go down OK but I am having some trouble getting them to go up without binding on the wing. 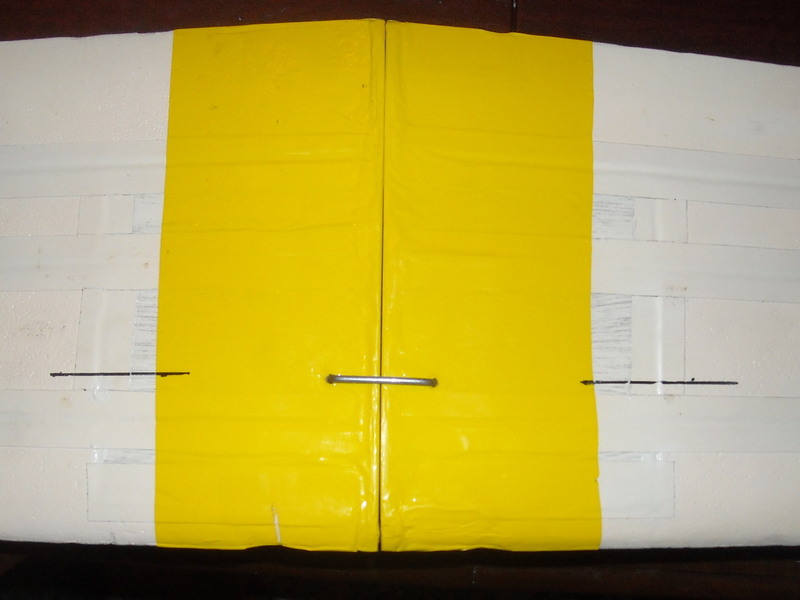 The top wing sheeting covers up about 5/8 on the aileron and boy if they are not perfect, they bind. 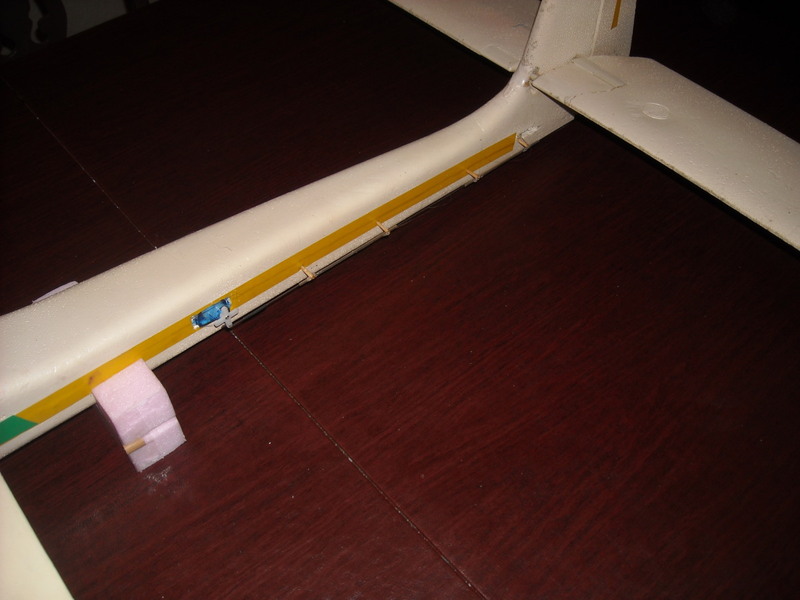 I'm real close to removing them and making new set of ailerons and using Robart hinges. But I like a challenge so I will keep playing with them . Hopefully I'm get them to work to my satisfaction.. Wish me luck. 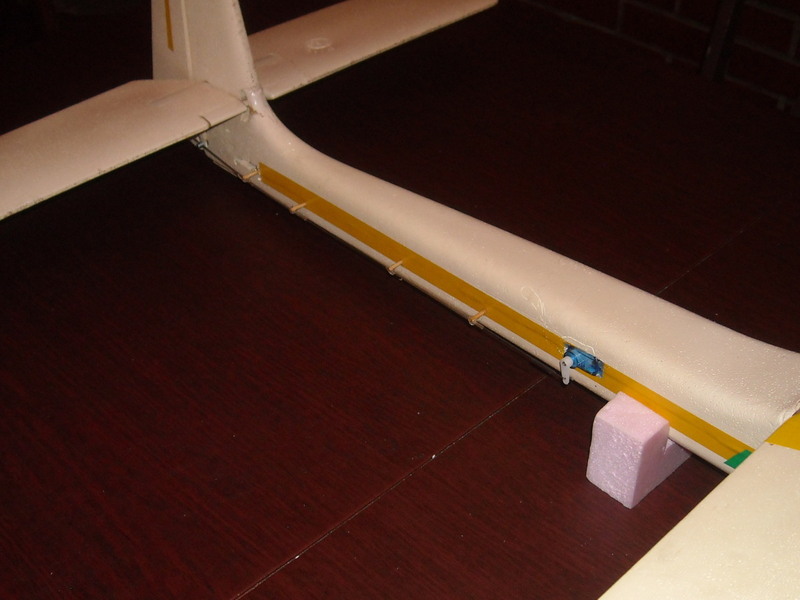 I installed the fus to wing fillet today and that went better then I expected. 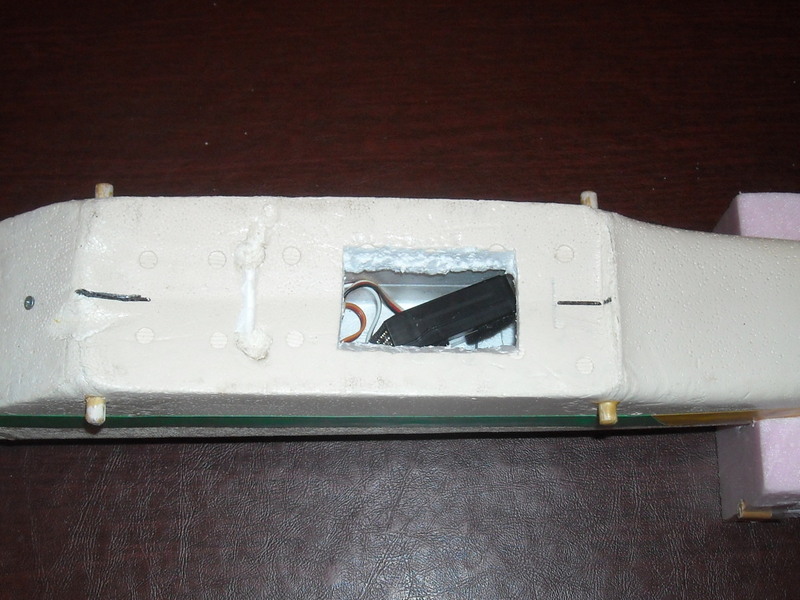 It also has 6 exhaust stacks that started out as a 1 ½ X 1 ½ X 3 ½. Balsa block. 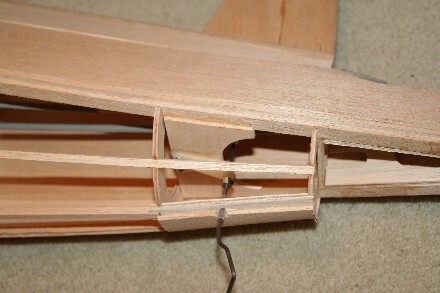 I traced the exhaust and transferred that to the balsa blocks. 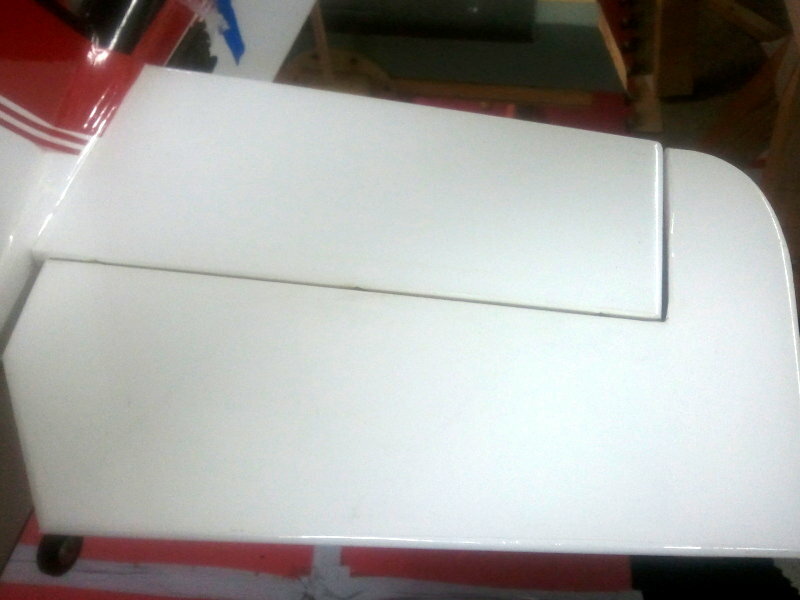 Then cut them out on a band saw and sanded and sanded and sanded some more. Got them done and installed on the fus. Looks pretty good. I had to put filler around them and tomorrow I will sand and sand some more.. I hate sanding!!!! 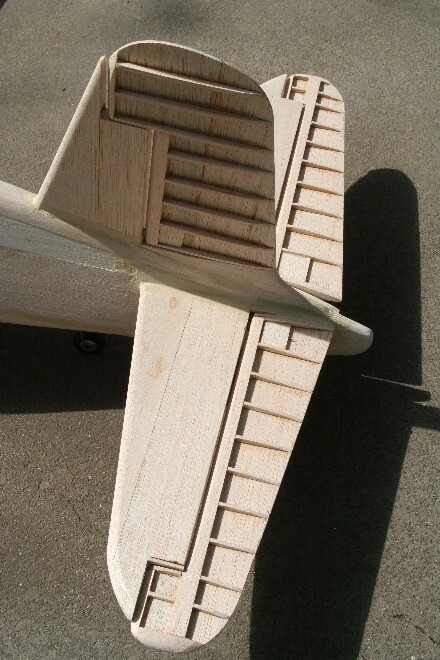 This plane is going to require a lot more sanding. 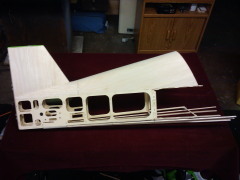 Then I will glass the whole plane. I am using 3/4oz cloth and I'm using the WEST SYSTEM EPOXY RESON. 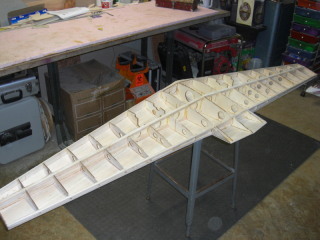 The cowling I will glass with 4oz (three layers) and then I plan on removing the wood. (Well it's a thought anyway) I used the west system when I was racing the big planes and it works out great and is east to use. 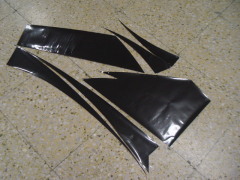 And easy to sand. And it looks good also.. 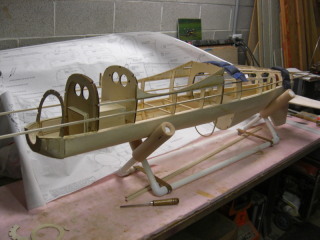 I'm looking forward to the finishing part. That means I am almost done. I still have to order the servos but the mounts and all in.. I need 10 servos. 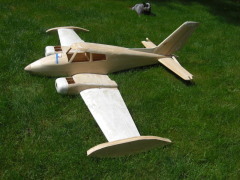 2 for elevators, 2 for aileron, 2 for flaps, 1 for rudder, 1 for the flaps, 1 for throttle and 1 for the chock. I may skip the choke. Or not. We will see. I still have to order the decals , but that is the easy part. All that is is a reorder. 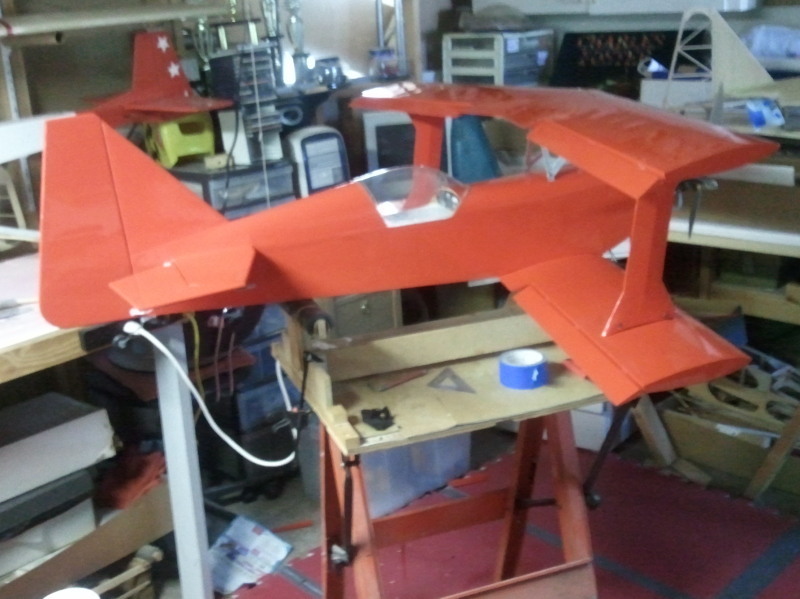 Hopefully I will have it ready to fly the 1st of May. Is that when the rain stops and it worms up? I hope so. 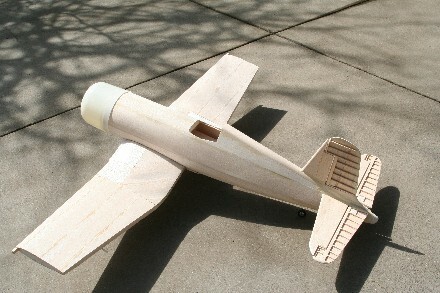 As I stated in the Dec.2011 projects I will be starting to build a Dewoitone D520. 90 inch. 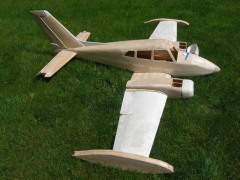 I had one of these before and one would think that after many years of flying and building, one would not make to many mistakes. 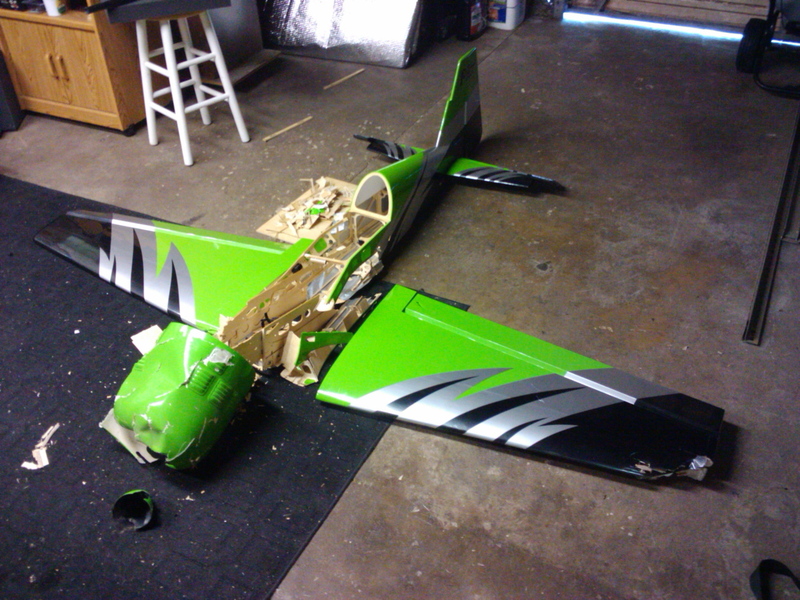 Well I crashed it . Yes I do admit it was my fault. Dumm Dumm!!.. Oh well. I will not go into details but I was stupid !!!. 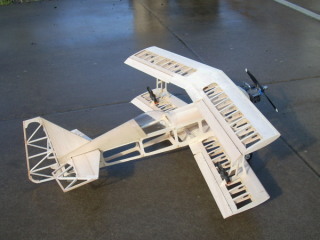 The reason I am building another one is two fold! 1) To prove to myself that I can do it and do it right this time. And 2) I have all the hardware for it. 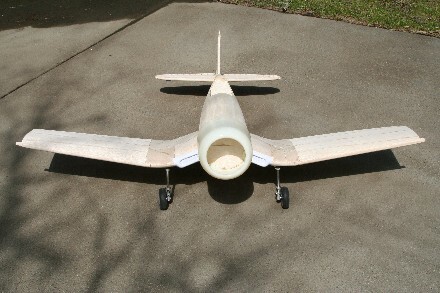 The retracts are unique to this airplane, they don't fit anything else. So way wast $750.00 retracts sitting on the shelf ? and I have a new engine for it also. 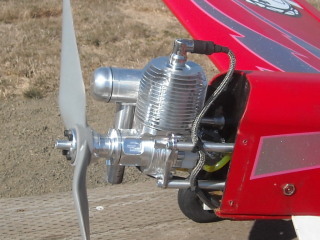 A Fuji 64cc. 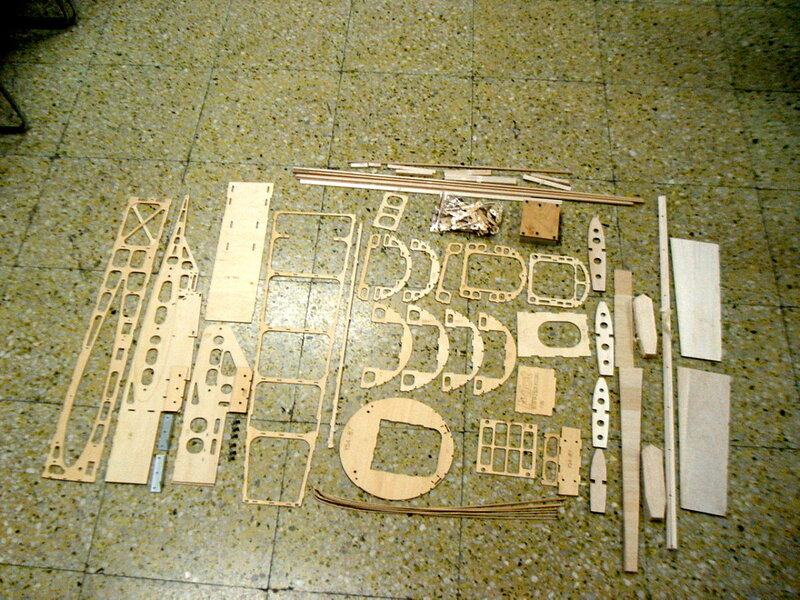 So here I am building another one!! The fus is an interesting build. You build the top and install the stabilizer and the vertical then sheet the top. Turn it over and install the bottom of the fus. 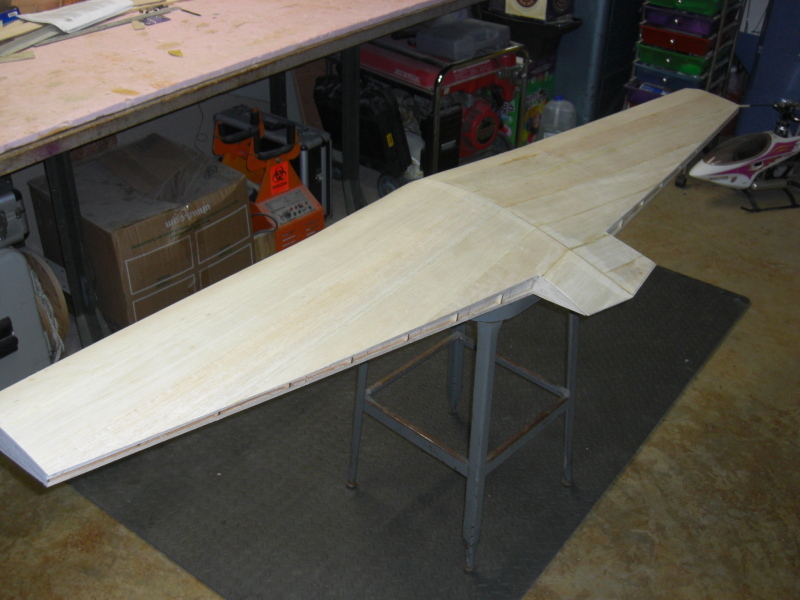 The wing is built , right half top and sheeted then left half top and sheeted on a common dihedral and spar. Then you turn it over and install everything else. Well I got the top done and turned it over and looked at the bottom and then put it on the shelf for later!!!!! 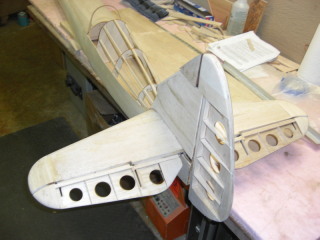 The fus and the wing have to come together about the same time so you can fit and sand and fit and sand and fit and sand,ect. Ya . You get the picture. 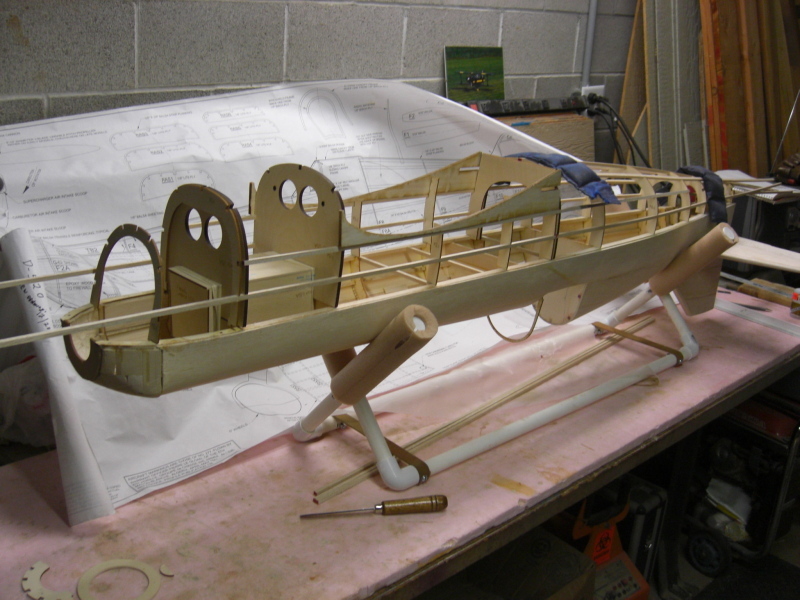 But it is coming together nicely. 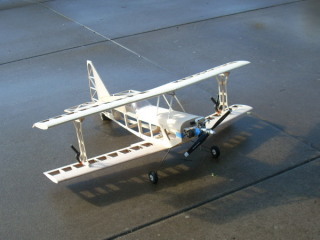 Here's a couple pics of the CAP 21 that I built from a kit. Its called "LOCO" for good reason. 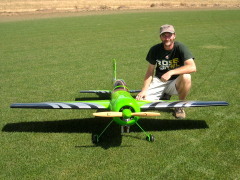 12 lb plane with a Monster Power 110. Way fast and pretty. But my opinions are kinda Biased! 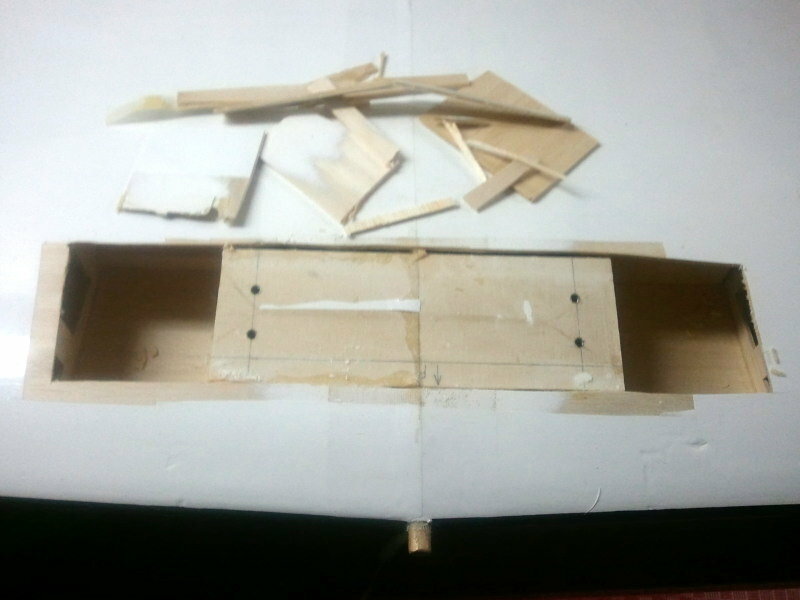 I bought an old Carl Goldberg Sukhoi SU-26 kit plane that was in need of some repair and was missing the landing gear. 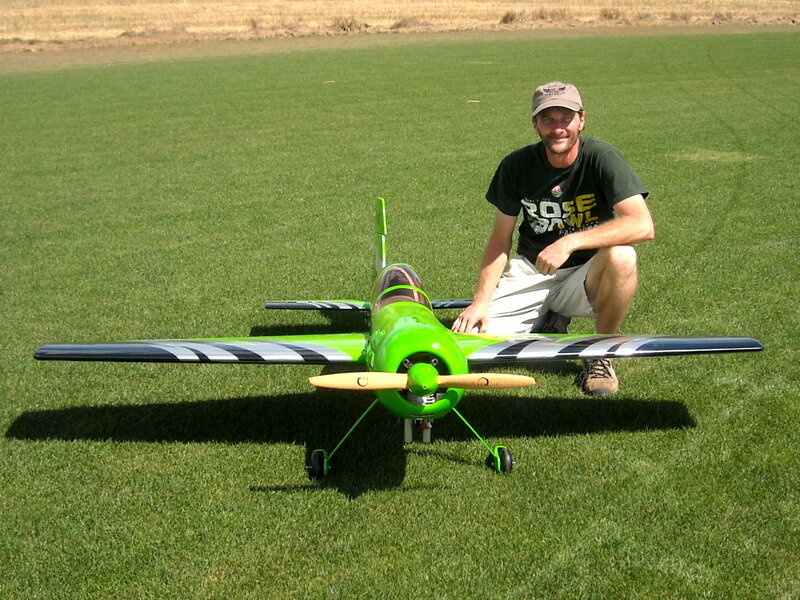 I decided to go big and found Jeff E. had a Super Tigre 3000S motor for sale. While this motor is not my first, second or third choice I could not pass it up due to its condition and price! Thanks Jeff! The motor is heavy and double the size recommendation for the plane but what the heck! 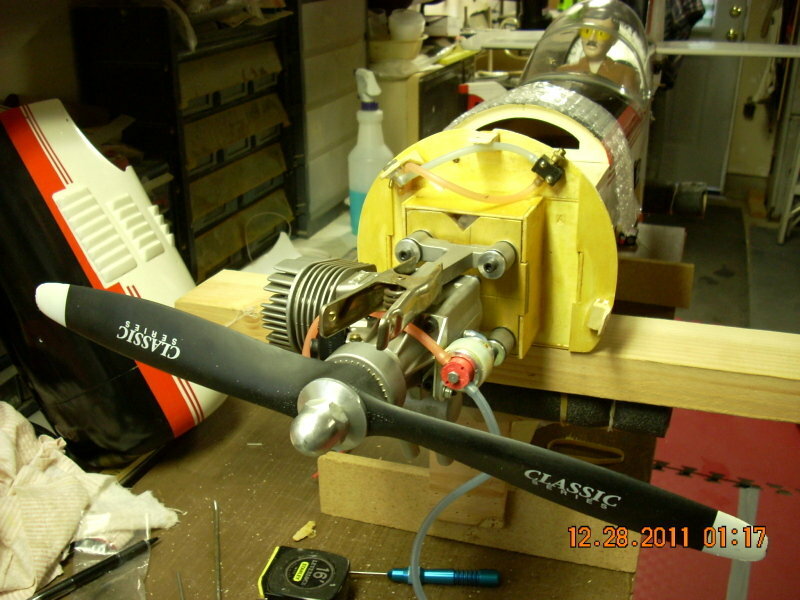 In order to put this big motor on Chick had to beef up the firewall and he mounted a larger motor mount to handle the engine size. 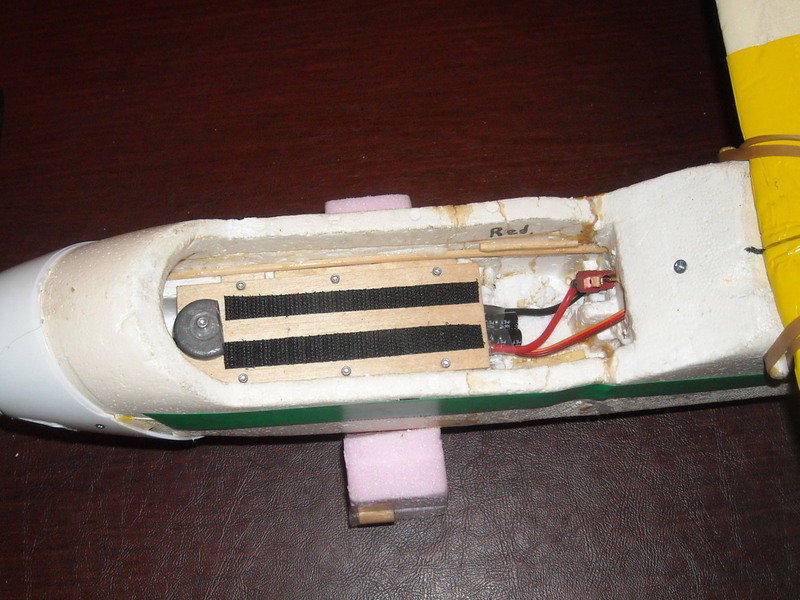 As he was going through the plane he noticed several areas of concern (weak firewall, stress fractures in the wing and the elevator rubbing the tail). He currently is working on the plane and I hope to have it out and in the air soon. 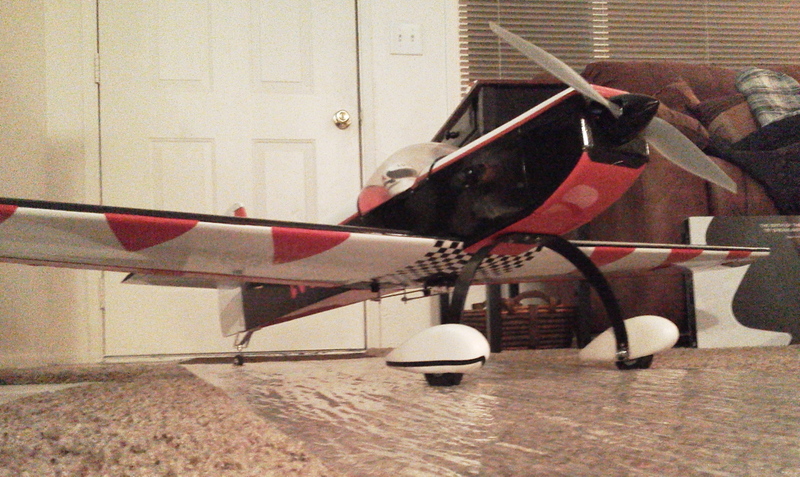 Its almost ready for flight. But weather and a good day to fly are a long way off. An update on the Corsair kit I received for Christmas, and brought to the club meeting. 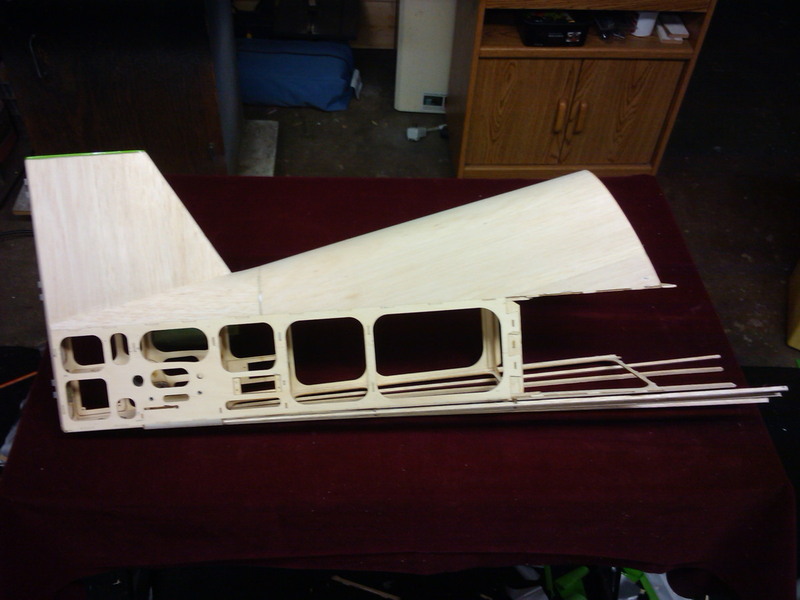 The tail surfaces are completed, and the fuselage is over half done. All of the control linkages for the elevator, rudder and tail wheel are all contained within the fuselage. Nothing is exposed. Building is moving quickly. 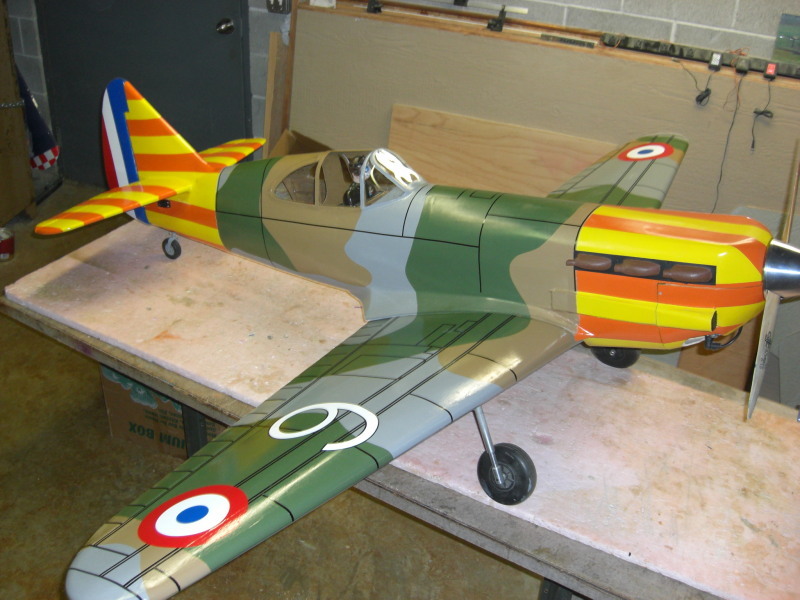 The last kit I built was in 1969, and I was 15 years old. A lot has changed. My only tools were discarded single edge razor blades and good old ambroid glue. 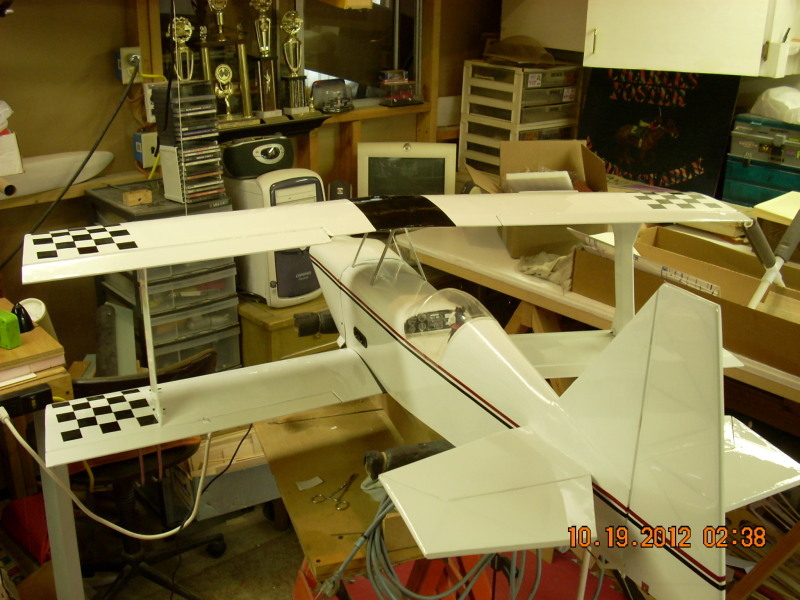 Now, x-acto knives, saws, dremel tools and CA glues. It almost builds itself. Will provide another update when more is done. I think it had a .15 in it. 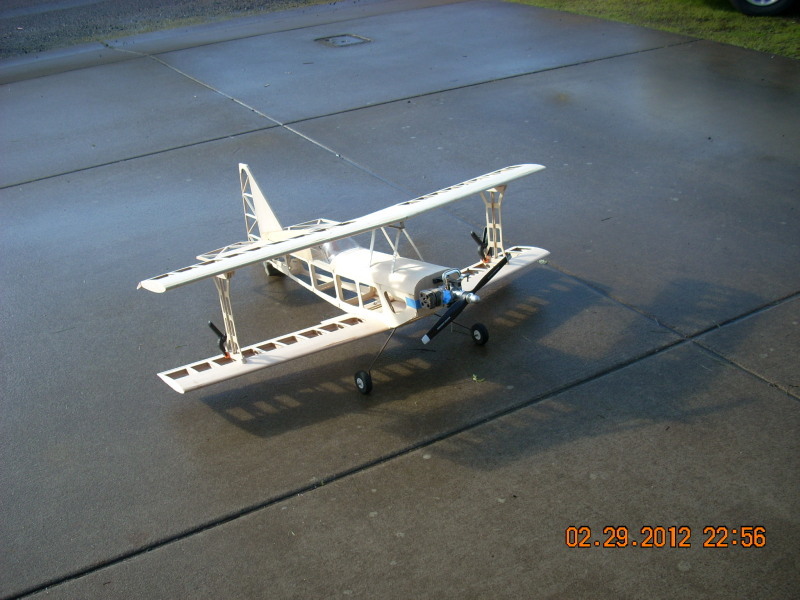 Jim Sherlock gave me the plane some time back. Think the name was Princess"
12-18-11 - Installed Servos - two 18G in wings, 9g for throttle, two Tower 3000s for rudder and elvevator. Installed Turnigy9 Rx and 900 ma NiCad bat. 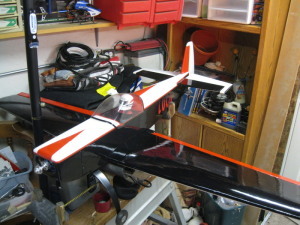 OS .15 with Muffler, MA 8x4 prop and 1 1/2" DuBro Red spinner. 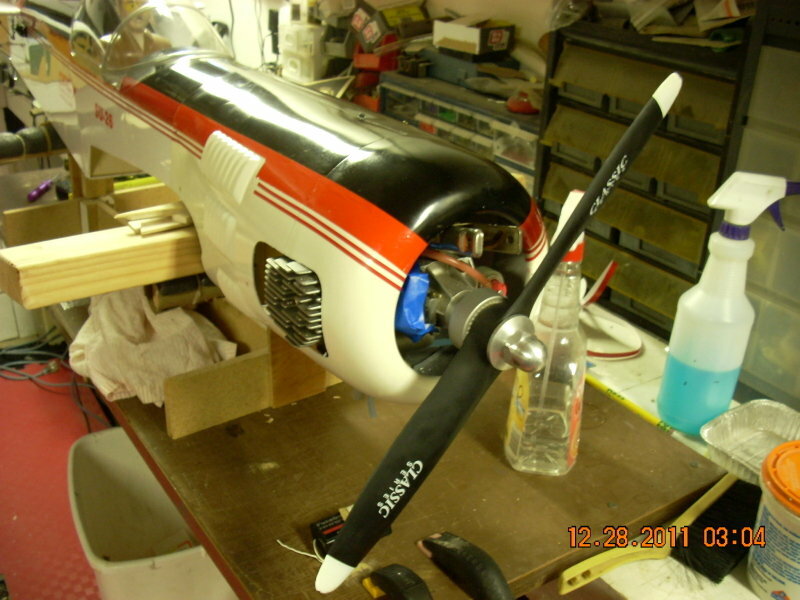 Installed Sullivan R-4 Standard Round 4 oz fuel tank (attached with foam tape), filter and hoses. 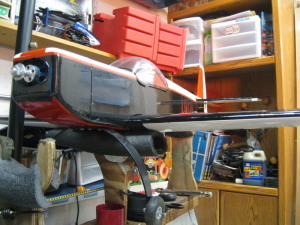 Foam taped the Rx to the bottom of the fuel tank. Added .4 oz of lead to nose, CG aprox on spar. Dry Weight 34.9 oz. 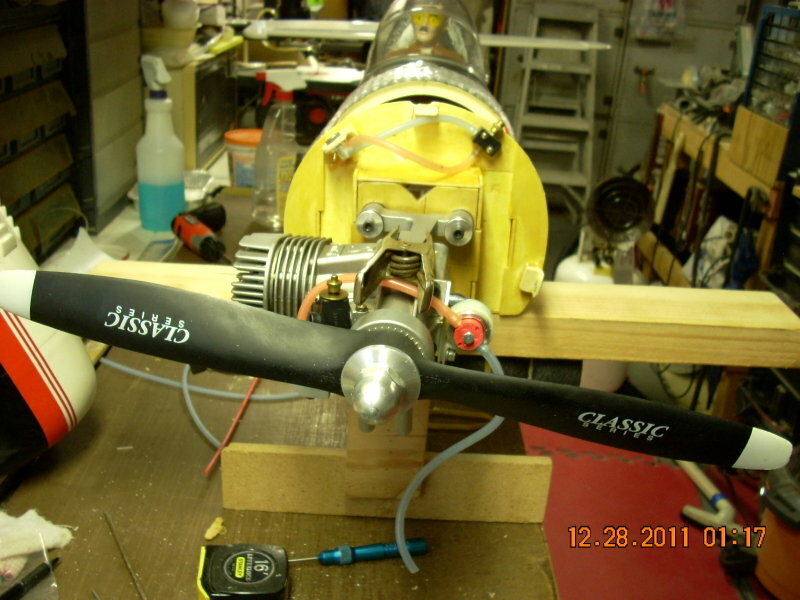 12-19-2011 - OS .15 started and ran OK (on the ground). 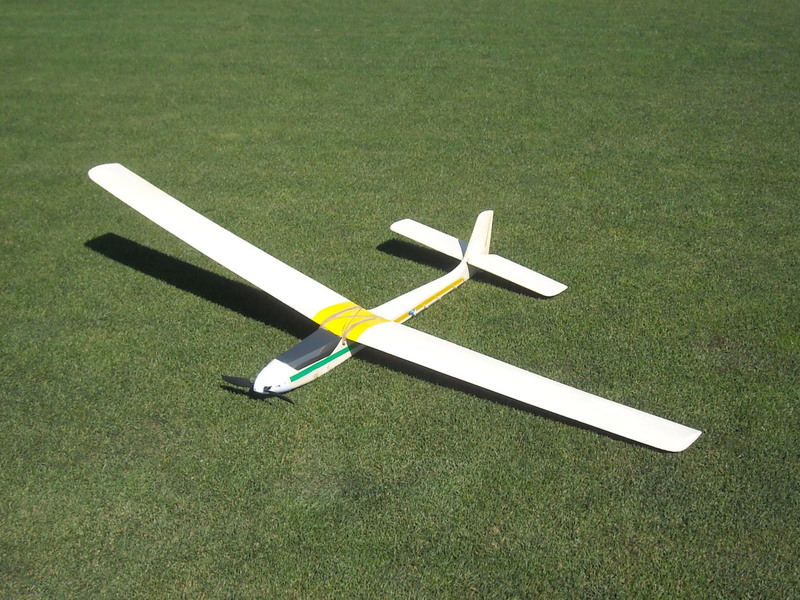 RX out of range at about 30 feet. Either bad RX or where the antenna is near the Engine is a bad spot. Need to test, and maybe swap to another RX. 12-23 - Removed Rx. Installed the one from Extra260 - Antenna taped to bottom of fuse (inside). Will try again. 1-3-2012 - Range check ok, taxied to each end of field and back. Enough power, take off nice. 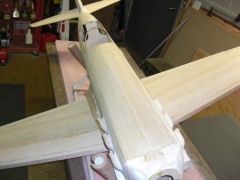 In the air it needed trim on elevator, aileron. Flys well. 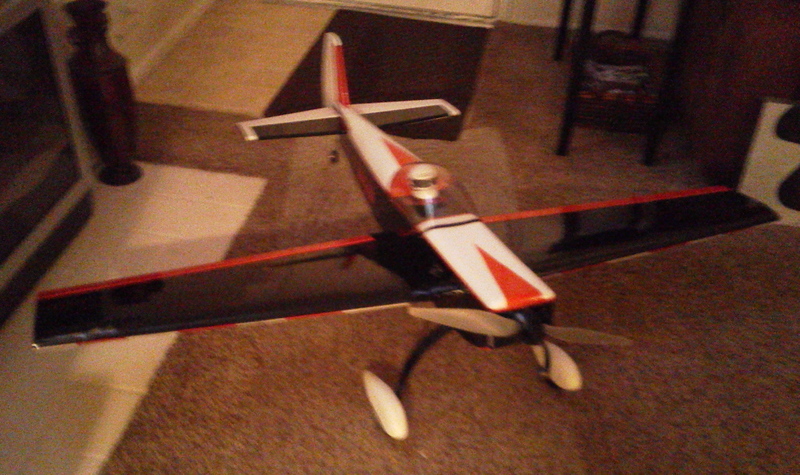 1-5 - Messed with needle adjustment, flys faster now, lands nice. 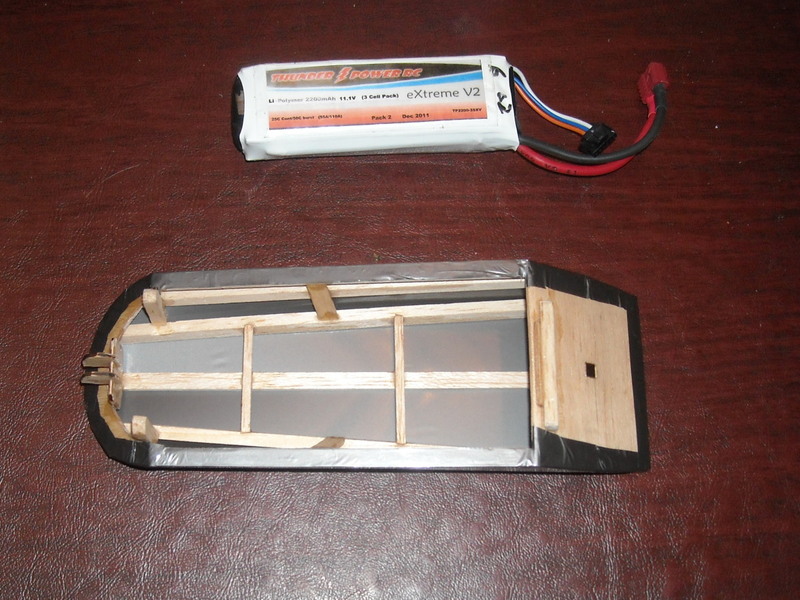 I just got done scratch building another Energizer. 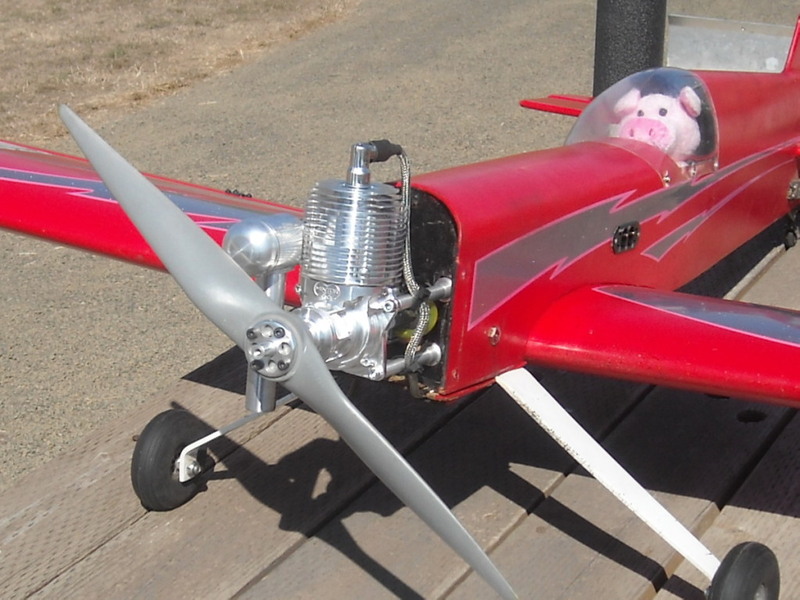 You may remember the other one with the bunnys on it and a G26 gas. I flew it for 8years and then it died. Because of a new radio that had a problem I was not aware of. 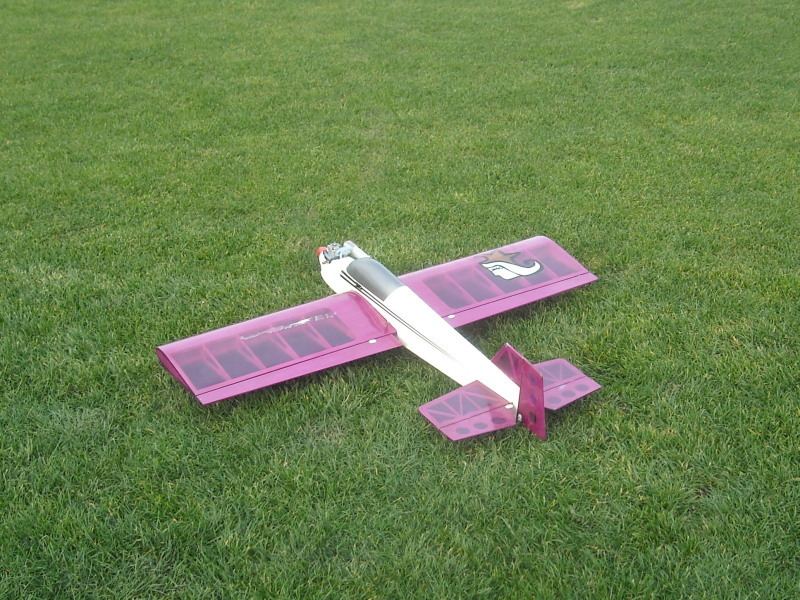 The Energizer is one of the best flying airplanes I have ever flown.. 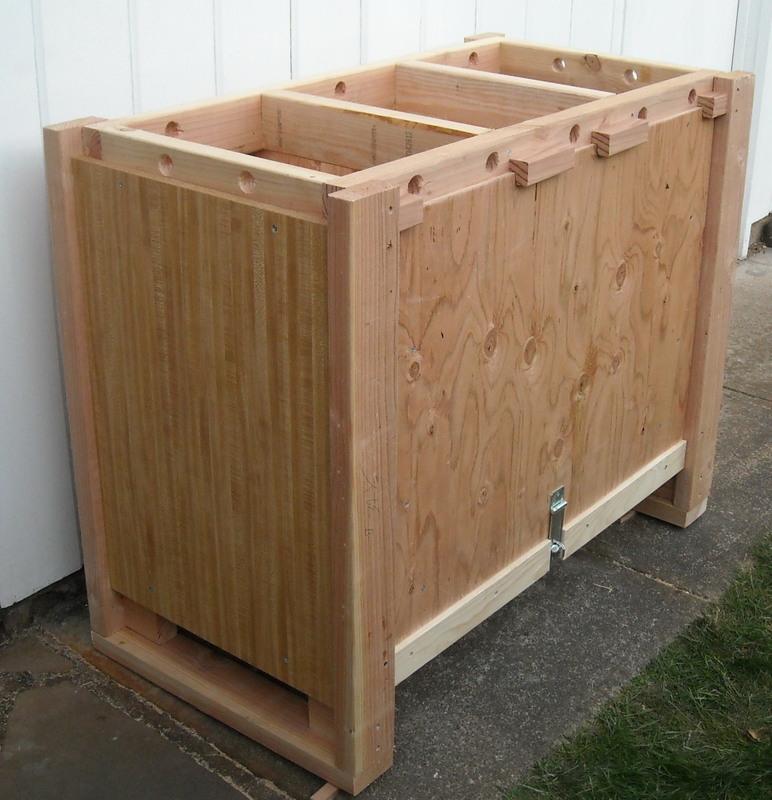 So I built another one.